I am splayed across my mattress, left arm under my head, eyes glued to the laptop screen watching the film Frida. The first glimpse of Salma Hayek sends my heart fluttering. I am convinced that this woman is a goddess; she could rip my heart out from its cage and I would let her. Here, her head lays on a pillow speckled with cross stitched motifs, her brows furrowed, and Frida’s classic red lipstick adorns her lips. After watching the film, I feel guilty for not having watched it before. I call myself a fake-Kahlo fan. Frida Kahlo, like most women, was overshadowed by her husband Diego Rivera. But unlike most women from that time, she wouldn’t tolerate it. Today, she is known as one of Mexico’s best 20th century artists famous for her self-portraits. In her starkly autobiographical paintings, she draws references from her own life and combines it with surrealist images. She painted herself in the most uncompromising way—bushy unibrows, a little hair on the upper lip, a little violence here and there to depict her own failing relationship with her body. The accident that she had when she was 18 put her body under various surgical tortures. She sustained a broken spinal column and eleven fractures in her right leg. I walk inside the narrow corridor of Humming Tree to catch Theatre Mi Amor’s production, My Diego, My Art. It’s a tribute to Frida Kahlo on her birthday. I am heaving a little, frantically calling D to ask if she bought me a ticket. It is a full house. When I’m finally in, I make my way past a sea of human heads. I walk by a woman wearing a short, glittery skirt, with a martini glass in her hand. I mouth an inaudible ‘sorry’ as my big bag shoves past her arm and make my way to where D is seated. On the stage is a wheelchair covered in hastily made handprints alongside which is an easel with paper taped to it. Below the easel is a toy macaw, which I’m guessing repeats everything you say, the kind we once gifted my cousin because we didn’t know what else to buy for her birthday. On the side of the room, people are seated in small booths with drinks in hand, immersed in conversations. In front of me a lady asks her friend, “Yeh Frida Kahlo Indian thi kya?” (Was Frida Kahlo Indian?) Somewhere a glass breaks because somebody has carelessly shifted in a chair. Someone clears their throat over the mic, and then there is an immediate cease in the chatter and the lights fade. The play begins, and Frida (played by Sindhu Murthy) appears on stage, with an array of flowers on her head atop high braids and a replica of the hand earrings that Pablo Picasso gave the real Frida Kahlo. 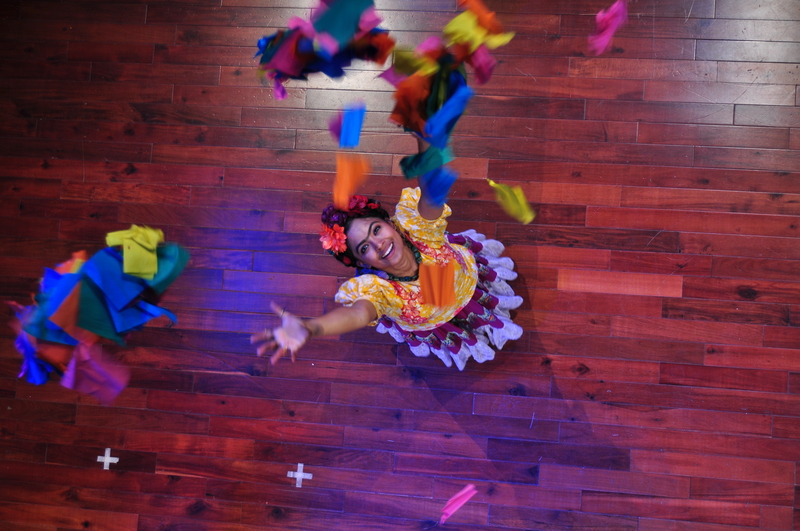 Murthy runs this one-woman play in a thick Spanish accent; sometimes she plays two parts simultaneously— alternating between Frida’s inner voice, her sister, Cristina Kahlo and sometimes her husband, Rivera. Murthy’s loud voice, interrupted by the occasional sniffle, has the audience captivated with Frida’s traditional tongue-in-cheek humour. “Oh yes we were talking about Immanuel Kant, Marx…you know the usual topics”, says Frida and she flails her arms and playfully struts across the stage, narrating an incident to her sister Cristina. The audience chuckles at this point and I wonder what their usual topics of discussion are. There was a lot of cussing, especially when Frida yells at Deigo for his unfaithful ways, but I don’t think anyone seemed to mind, especially since there weren’t any older people to click their tongues in disapproval. Instead the audience tittered and seemed to enjoy it. Switching to the character of Diego Rivera, Frida says “I’m physiologically incapable of fidelity”; the audience chuckles. At this point I think about the film Frida where Diego was constantly cheating on Frida and she kept giving him second chances. Later it got so bad that they started living in different houses, connected by a bridge; a detail I found rather fascinating. Once, after Rivera cheats on her by sleeping with Cristina (her sister), Frida is shattered. On stage, her wails are loud and shrill, the kind that occur only when someone dies. Rivera begs her to open the door leading to the house, while Frida sobs unremittingly. Rivera remarks “It was just a f***. I’ve given more affection in a handshake.” The audience sniggers. Murthy slips from one character to the other so seamlessly that my head moves from one side to another as if I am watching a tennis match. Frida describes the relationship between herself and her imaginary friend, also called Frida. She renders the famous line, “I used to think I was the strangest person in the world, but then I thought there are so many people in the world there must be someone just like me who feels bizarre and flawed in the same ways I do”. I think this was also the inspiration behind one of her iconic pieces “The Two Fridas”, where two seated figures share a bench and behind them, is a stormy sky. They are identical twins, their hearts connected by a string. Soon after, Frida breaks into a song in Spanish, the words of which I’m unable to decipher but sound beautiful nevertheless. Frida moves from one point on the stage to another, her candy pink skirt covers her toes so it looks like she’s floating. The real Frida Kahlo hobbled due to various injuries, but in my head even her hobble is graceful. In the film, when Frida Kahlo dies, her bed shoots up in the air like a firecracker and she quips, “I hope the exit is joyful and I hope to never return”. In the play, Frida dons a Venetian carnival mask while she says those very words, and disappears into the wings. I think of those very words when I exit the venue, smiling to myself as I plan to watch the film again later that night. Srishti | Bangalore. Currenly she spends her time tending to her plants and indulging in her caffeine addiction. Skills include making list of lists and taking photographs. Fears include very bubbly people, butterflies & clowns. 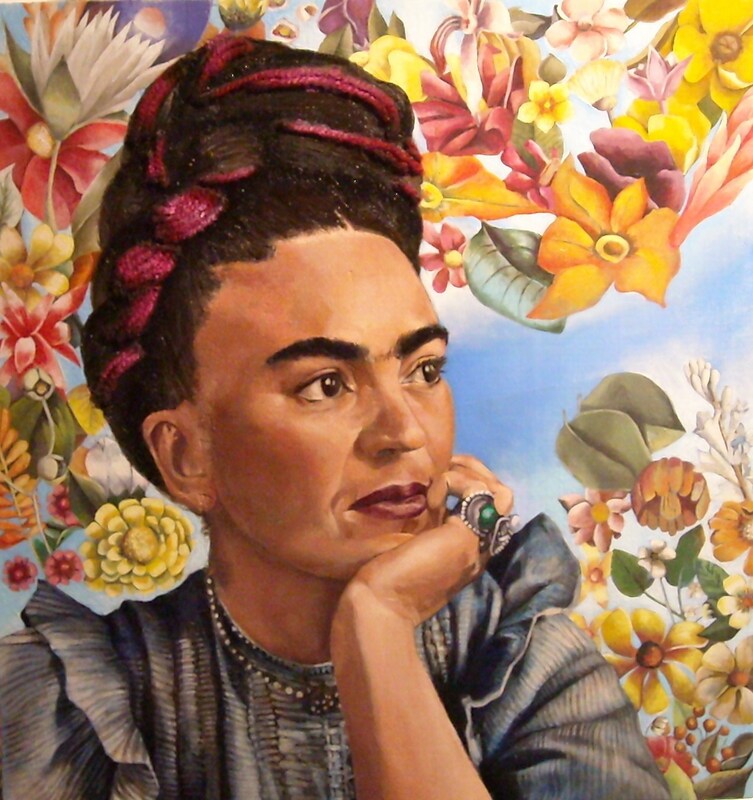 Your article makes “Frida’ come alive ! !